Like all veg, an 80g serving of carrots – that’s equivalent to about ½ a medium-sized carrot or 3 heaped tablespoons – counts as one of your 5-A-DAY. Carrots are packed with fibre, which helps to keep the digestive system healthy and helps to balance your blood glucose (sugar) levels. Fibre also helps you to feel fuller for longer so that you find it easier to maintain your weight. An 80g serving of cooked carrots contains more than 2g fibre – more than a tenth of the recommended daily amount for adults. Carrots really can help you see in the dark. Beta-carotene, found in large amounts in carrots is converted into vitamin A in the body and this vitamin is vital for healthy vision. Vitamin A works its eye health magic by being transformed into a purple pigment called rhodopsin in the retina, and this pigment is essential for vision in dim light. Carrots are great for healthy, younger looking skin. 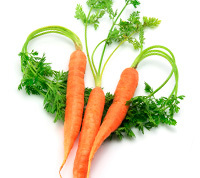 Beta-carotene – naturally found in abundance in carrots – is an important antioxidant nutrient. This is great news for our skin as the antioxidant action of beta-carotene may help to act against age-accelerating free radicals, so that our skin remains healthy and elastic. Carrots are packed with the vibrant orange pigment beta-carotene, which is a supernutrient. German scientists believe that this collects under our skin to give us an internal “sun protection factor” (SPF) of about 4, helping to protect our skin from sun damage all year round and excessive ultra-violet (UV) radiation. That’s not to say you should ditch your sunscreen if you eat a lot of carrots! You should still follow sun safety advice and cover up during the hottest part of the day, wear a hat and regularly slather on sun screen with a high SPF. Vitamin A is essential for the proper functioning of the immune system. This nutrient keeps the skin and cells that line the airways, digestive tract and urinary tract healthy, so they act as barriers and form the body’s first line of defense against infection. 1. National Diet and Nutrition Survey: Young People Aged 4-18 Years. 2000. 2. The National Diet and Nutrition Survey: Adults Aged 19 to 64 Years. Volume 2, 2003. 3. The American Journal of Clinical Nutrition, Volume 80, No 2, 2004. 4. European Journal of Nutrition, Volume 42, Number 6, 2003.